My deployment in Kosovo in 2016 helped me gain a better understanding of how C. G. Jung’s typology can improve intelligence management and intelligence operations. Ninety percent of the problems I experienced resulted from a few common pitfalls that with proper training and planning could have been prevented. These pitfalls included faulty assumptions—a belief one assumes as true even though it is inaccurate and lacks empirical evidence—which are tied to confirmation bias. Confirmation bias is the tendency to seek out, interpret, prefer, and recall information in a way that confirms one’s beliefs or hypotheses while giving disproportionately less consideration to alternative possibilities. Because people are especially prone to unconsciously applying their biases when confronted with unfamiliar situations, intelligence operations are particularly vulnerable to such distortions. No one can completely remove his or her subjectivity when analyzing information, but intelligence professionals could certainly improve how effectively they manage and execute intelligence operations by understanding how different types of people construct different operational pictures through cognitive biases. Intelligence professionals are prone to let the OE reinforce and confirm their own biases. The cognitive biases that so often beset intelligence operations can be mitigated by the Department of Defense (DoD) in practical and cost-effective ways. Richard Heuer’s classic The Psychology of Intelligence Analysis helps bridge the gulf between intelligence analysis and depth psychology. In this work, Heuer (1999) wrote about “cognitive biases,” which he defined as “mental errors caused by our simplified information processing strategies” (p. 11). One’s typological preferences can exacerbate these biases. A familiarity with Jung’s typology could, however, help check them. For the U. S. intelligence community, typology has the potential to become a force multiplier, that is, “a tangible or intangible variable that increases the combat value and overall capability of a military force” (U. S. Army, 1989, p. 5-1) when planning and conducting military operations in the twenty-first century. Thus, the military needs to do a better job of institutionalizing sound processes and methods to apply checks and balances to cognitive biases. Commanders and their staff could use typology as an effective tool to enhance not only self-awareness but also situational understanding of the OE. Although DoD and the Army have made incremental progress in the application of typology by including it at professional military education institutions (i.e., Command and General Staff Course), the training does not prescribe specific ways to apply type theory to military methodologies such as intelligence preparation of the OE. DoD could support officers and leaders by developing and incorporating more typological applications into its professional education programs. In fact, enhancing self-awareness is the best way, perhaps the only way, to construct an intelligence model that accounts for the subjective human factor, which could have offset the aforementioned problems and would have advanced the intelligence mission in Kosovo during the deployment. The United States has played a leadership role in the NATO-led Kosovo Force (KFOR) since 1999. 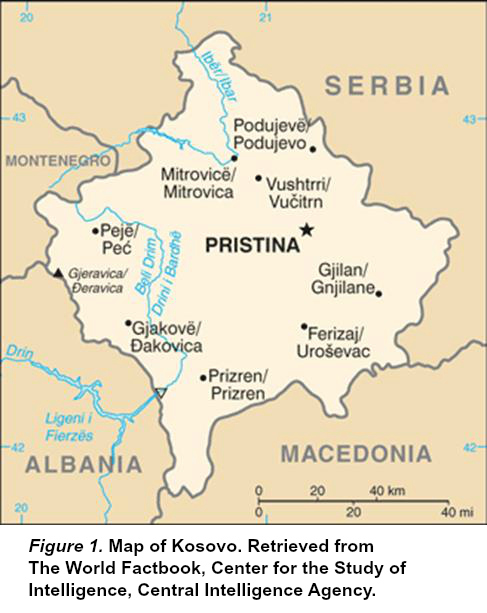 Military intervention in the Kosovo war was authorized by United Nations Security Council Resolution 1244, which also set the conditions for the demilitarization of Kosovo (Figure 1). The area of operation (AO) has undergone a series of evolutions since it was established. Today KFOR consists of four principal NATO partners—the U. S., Italy, Switzerland, and Turkey. KFOR contingents are currently organized by three joint regional directorates (JRD) and two multinational battle groups (MNBG). The battle groups are functionally organized, not “land owners” in the traditional sense. The JRD commanders control the battle space and are in charge of the AO occupied by the battle groups. Thus, the U. S. commander technically has two commanders: the commander of United States Army Europe and the multinational KFOR commander, who is usually an Italian officer. MNBG-East is the U. S. contingent and is responsible for an AO spanning from the northern administrative boundary line (ABL) to the southern ABL bordering Macedonia. Kosovo itself is about the size of the state of Connecticut. The contemporary example of Kosovo illustrates how much legal precedence, fragile alliances, and cultural fault lines have shaped the emerging world order, especially in Eastern Europe. For example, Spain, a member of NATO, does not acknowledge Kosovo as a country because of how such precedence would affect its historical foreign policy towards the separatist movement in Catalonia. NATO partner Greece, a traditional ally of Serbia, also has expressed no interest in recognizing Kosovo as a sovereign state. Thus, KFOR partners are prohibited from referring to the government of Kosovo but must instead use neutral terms like “institutions in Kosovo.” Additionally, because some KFOR partners do not recognize Kosovo as a country, the boundary between Serbia and Kosovo cannot be referred to as a border. To preserve semantic neutrality, KFOR refers to it as the ABL. Kosovo thus is as much an evolving concept as it is a nascent nation-state due to historical, political, and psychological factors. Intelligence analysts must utilize the sum total of intelligence available in the intelligence community in order to build a more comprehensive and accurate picture of threats and relevant aspects of the operational environment. Intelligence analysts analyze anything in the OE that might adversely impact the commander’s ability to conduct his mission, which in the case of Kosovo means maintaining a safe and secure environment and maintaining freedom of movement throughout the AO. The commander, with the aid of his staff, updates unit level intelligence requirements as needed. These requirements guide the collection effort and should be aligned with the higher headquarters’ priority intelligence requirements (PIR). An “intelligence requirement” is “a priority for intelligence support, that the commander and staff need to understand the adversary or other aspects of the operational environment” (Joint Chiefs of Staff, 2012, p. GL-15). The major analytical engine in the battle group consists of the Analysis and Control Element (ACE), which “performs collection management, produces all-source intelligence, provides SIGINT technical control, produces GEOINT products, and disseminates intelligence and targeting data to the headquarters and subordinate intelligence cells” (U. S. Army, 2014, p. 3-3). The ACE forms the analytical linchpin of long-term predictive analysis and intelligence fusion. Its personnel manage, collate, and convert raw data into useable intelligence products, which analysts may further codify and grasp through the heuristic tool known by the military acronym PMESII-PT (Political, Military, Economic, Social, Infrastructure, Information, Physical Environment, and Time). PMESII-PT is used to break up a complex OE into a manageable number of operational variables. Any one of these variables can influence the commander’s ability to accomplish the mission. Military planners and intelligence officers use PMESII-PT as an analytic starting point for long-term analysis of the OE. By analyzing these variables, the ACE provides an analytic picture for the commander, which enhances his understanding of the OE. Ideally, every analytical assessment will inform the commander’s decision-making process. 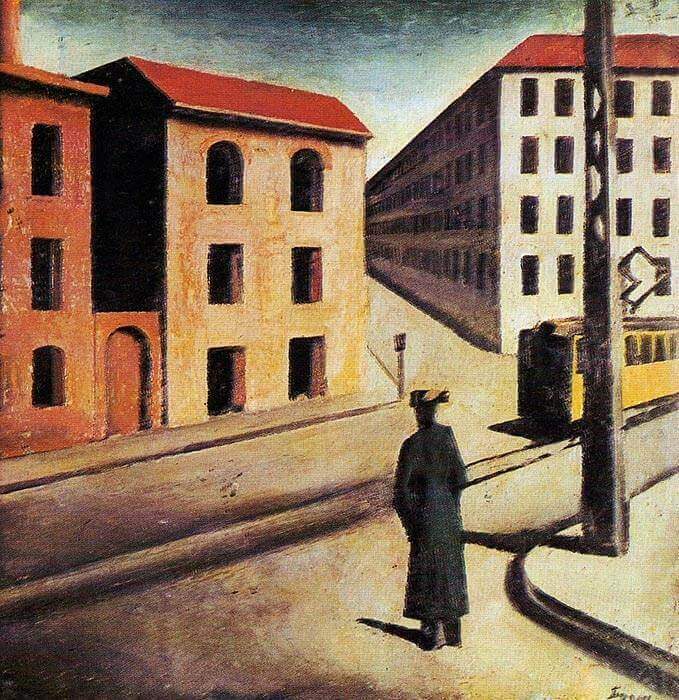 Jung’s theory of psychological types describes the ways people experience reality and the images (i.e., representations) that make up the phenomenal foreground of human experience. Both perceiving functions and judging functions express themselves either in a dynamic or a static configuration. 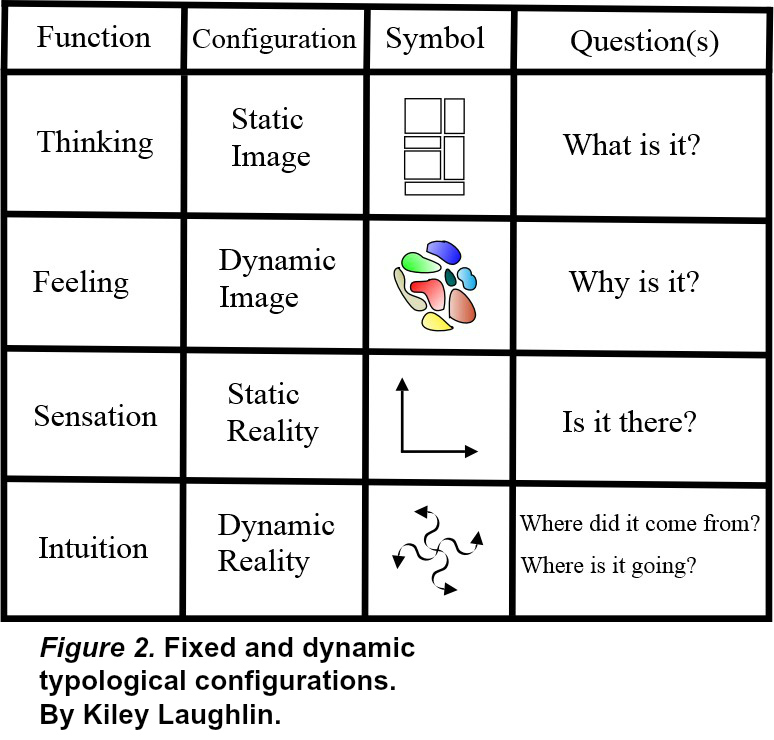 Jung (1989/2012) described these configurations as follows: “(1) static reality that comes to us through sensation; (2) the dynamic reality revealed by intuition; (3) static images given [to] us by thinking; (4) dynamic images sensed by feeling” (p. 134) (Figure 2). The functions, therefore, could be viewed as the four principal ways the mind relates to the world, or put differently, symbolic gateways that mediate social and environmental interactions. Such a schema suggests one’s simultaneous experience of inner and outer reality and the attendant images that occupy the conscious mind. Sensation and intuition then could be viewed as two distinct modes of perceptual reality. Sensation suggests a static reality of actuality whereas intuition describes a dynamic reality of possibility. Because the former and latter are perceiving functions and occur spontaneously in the background, one does not need to judge to use them. Conversely, thinking and feeling come to us as quanta of conscious experience in both fixed and dynamic configurations. 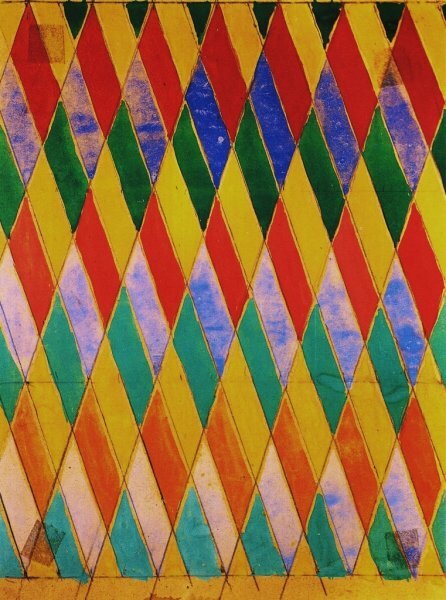 Jung (1927/1970) considered thinking a “process of recognition” (¶ 290). Thinking recognizes, orders, and compares the datum of experience from apperception—“a psychic process by which a new content is articulated with similar, already existing contents in such a way that it becomes understood, apprehended, or ‘clear’” (Jung, 1921/1971, ¶ 683). Thus, thinking by its very nature is an apperceptive activity. For instance, when it sees a fire, the conscious mind associates the sight of fire with the primordial “experience” (i.e., image) of fire. That is to say, thinking acknowledges fire for what it is and what it means, which is essentially a form of recognition. Feeling, on the other hand, is a process of evaluation. Feeling assigns the image a value. Categorizing the fire as a class of experience is only part of the equation. Feeling complements thinking by telling us whether the phenomenon is good or bad, pleasant or unpleasant, or whether it should be accepted or rejected. Of course, thinking and feeling do not occur sequentially but take place simultaneously and in varying degrees depending on the individual’s innate typological preferences. Because thinking and feeling presuppose a conscious experience, they occur in the foreground as contents of awareness. Both are predicated on an experience: a fire, a kiss, etc. 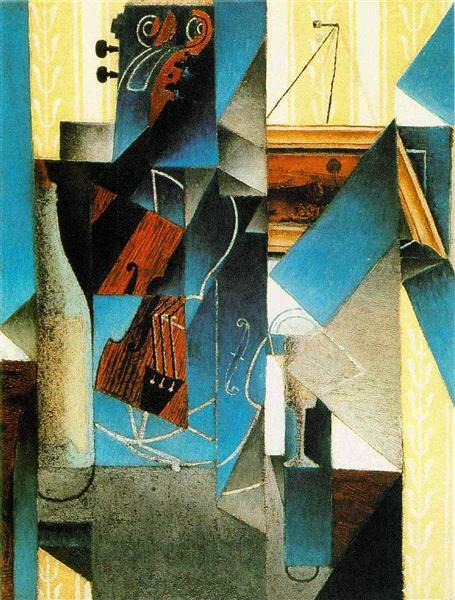 However, while thinking implies a static image (i.e., a concept), feeling presupposes a dynamic one (i.e., a value). Jung’s description of a dynamic and fixed subset of the functions suggests a useful way to apply typology to intelligence methodologies. Intelligence operations are conducted by following a five-step process: 1) planning and directing, 2) collection, 3) processing, 4) analysis and production, and 5) dissemination (Figure 3). Each step requires the use of the four functions in varying degrees. Leaders must first plan and direct by seeking answers about what will best advance the mission. Such questions entail determining not only what success means and looks like but also what the desired end state should be, which necessitates a value judgment and hence feeling. Thus, Jung’s functions, especially the two judging modes, figure prominently into intelligence work. While there are two ways to collect information, sensation and intuition, intelligence collectors are largely dependent on sensation, using their eyes and ears or extending their observational reach through technical means. The information is gained through various sources to include human, signal, and geospatial. Although the military privileges sensation, intuition plays an essential role in the process as well—a role which is just as important as sensation yet rarely mentioned in military intelligence doctrine. Extraverted intuition (Ne), for example, shapes the collector’s perception of patterns and connections in the environment. This raw information is processed and subsequently analyzed and published as an intelligence product. 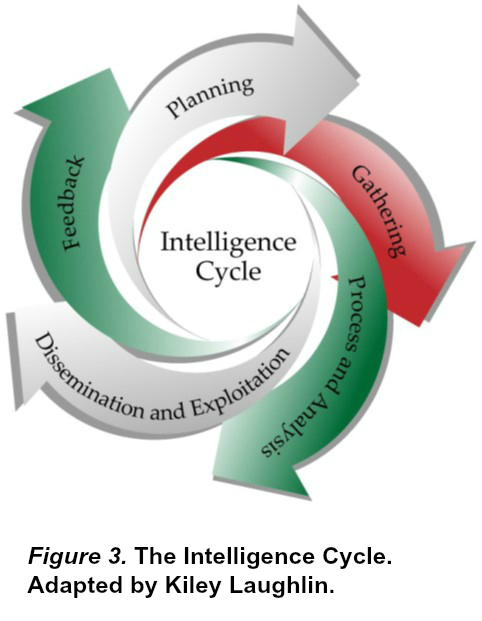 During this “analysis and production” phase of the intelligence cycle, the analyst apportions meaning to the information and generates an assessment. This step is arguably the most important one in the intelligence cycle because the judging functions interpret the information and put it in rational terms. Both thinking and feeling are required to produce a balanced and relevant assessment. Finally, the intelligence is disseminated to the intelligence community and policy-makers, who apply their own interpretation. What follows is further feedback and inquiry about the meaning and value of the reporting in a cyclical process. This may all seem straightforward. However, the intelligence cycle rarely proceeds in a linear fashion, and analysts must continuously update their assessments when confronted with new information. Analysts should constantly guard themselves against analytical pitfalls, such as succumbing to cognitive bias or yielding to group think, which often occurs in the echo chamber of intelligence analysis. The analytic consensus that arises as a result of group think can easily lead to inaccurate assessments, which are reinforced by analysts who share the same typological preferences. Majority support for a hypothesis does not make it correct. Consciousness in its two judging modes (i.e., thinking and feeling) is essentially a hermeneutic undertaking. That is to say, every conscious act, whether it is sorting abstract data or coming to grips with a complex social problem, involves interpretation. Intelligence, too, is to some degree a hermeneutic enterprise in that it requires the interpretation of information. Army Doctrine Publication (ADP) 2-0, the Army’s manual on intelligence, defines intelligence as “the product resulting from the collection, processing, integration, evaluation, analysis, and interpretation [italics added] of available information concerning foreign nations, hostile or potentially hostile forces or elements, or areas of actual or potential operations” (U. S. Army, 2012, p. 1). Thus, intelligence, like thinking and feeling, involves the recognition and evaluation of information. A careful review of the etymology of the word “interpret” suggests that the object of analysis is translated or converted from information to intelligence through the faculties of thinking and feeling. The word’s Latin roots, inter- and per-, suggest a trafficking or exchange of information which thereby “renders [the object of analysis] clear or explicit” (Interpret, 2017). When analysts interpret a complex problem, they tend to use their preferred judging function, which will slant their assessments toward thinking or feeling. Although the emphasis is always on objectivity, the preferred judging function tends to guide the interpretation of the information given. A quality-of-information or relevancy check can help counter the bias present in typological preferences as long as the intelligence supervisor is aware of his own typological tendencies. An approach combining self-awareness and professionalism is really the best way to identify unconscious biases and properly contextualize the information. Although articulated differently, both viewpoints suggest that people are born with innate unconscious tendencies of psychic functioning shaped by collective experience. Heuer (1999) further observed that “Intelligence analysts should be self-conscious about their reasoning process. They should think about how they make judgments and reach conclusions, not just about the judgments and conclusions themselves” (p. 31). 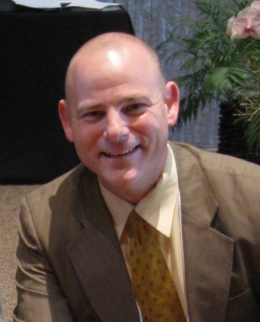 Heuer is describing a critical mindset that can overcome the unconscious mental-models that inhibit our reasoning. Carol Dweck’s (2016) contention that there are two principal mindsets, fixed and growth, seems to support Heuer’s viewpoint in that he too draws distinctions between different kinds of mindsets. Whereas a fixed mindset inhibits one’s potential, the growth mindset “is based on the belief that your basic qualities are things you can cultivate through your efforts, your strategies, and help from others” (p. 7). The essential difference between these two mindsets is the degree by which the individual can consciously exercise and apply his functions to the task at hand or know when to rely on another person whose typology is better suited to tackle the problem. One could equate the process to perceiving the world through a lens or screen that distorts the images that are produced. To achieve the clearest picture of Kosovo, for instance, analysts need more than information on Kosovo. They also need to understand their own lenses through which this information passes. These lenses are variously called mental models, mind-sets, frames, biases, or analytical assumptions (p. 4). The CIA (2009) has defined these so-called lenses as “experience-based constructs of assumptions and expectations both about the world in general and more specific domains,” adding that, “These constructs strongly influence what information analysts will accept—that is, data that are in accordance with analysts’ unconscious mental models are more likely to be perceived and remembered than information that is at odds with them” (p. 1). Different assumptions may lead to different interpretations and intelligence assessments, which are not always based on fact. For example, during my first tour in Kosovo, a reporting stream surfaced that indicated an attack on Camp Bondsteel. Islamic extremists were believed to have radicalized the subject of the reporting. Although it is important to take such reports seriously and try to corroborate the information therein, since September 11, 2001, many Americans have become sensitized to the effects of terrorist attacks carried out in the name of Islam and have tended to jump to conclusions about the likelihood of such attacks happening again. In one case, a person proposed the hypothesis that the subject intended to use an airplane to target Camp Bondsteel, even though no reporting substantiated such a tactic. Thus, assumptions are often unconsciously processed as facts due to biases. Intelligence analysts need to ensure that they clearly define and specify the difference between an inference and an assumption and not be afraid to professionally point out errors in the thinking of their superiors. In intelligence operations, everyone, regardless of rank or position, should aspire to understand his or her own biases and cultivate an environment that encourages candid input and feedback. Military intelligence is a personality-centric career field because of its reliance on the subjective factor, which tends to creep into every intelligence assessment regardless of how analytically rigorous it attempts to be. Analysts are innately biased and differ in their typological tendencies. To help reduce bias, intelligence professionals have developed brainstorming analytic techniques so that an analytical cell can offset individual biases. By arranging an analytical team into pairs or groups of soldiers, one can theoretically establish a broader and more comprehensive picture (or analysis) of a complex problem and proceed to draw clearer lines of effort with the assistance of the commander’s staff. If these cells were intentionally constructed with personnel with contrasting typologies, their capacity for correcting for cognitive biases could be greatly enhanced. Cross-type collaboration is essential to intelligence analysis in that it fosters a better understanding of the typological differences present within a team as well as guarding against individual biases. When the bias of leaders clouds the judgment of subordinates, the entire intelligence cycle could be derailed and intelligence assessments skewed dramatically. Military leaders, especially commanders and their staff, frame the underlying problem of the operational environment. The commander, for instance, seeks to articulate the requirements he needs to successfully accomplish the mission’s objectives. At the same time, the staff attempts to help the commander define what factors may deter him from accomplishing those goals. If staff members do not properly brief their commander about the main characteristics of the OE, or if a biased commander does not heed recommendations supported by empirical data, intelligence can no longer effectively drive operations. What follows is a circular feedback loop wherein the unit’s intelligence section fails to ask the right questions or unnecessarily injects the commander’s own biased assumptions into the collection and production steps of the intelligence cycle. In order to avoid these pitfalls, intelligence analysts should always consider a few important questions: What is the source of the information? Is the source reliable? Is the information corroborated by another intelligence discipline? Did the collector properly interpret the source of information? What are the underlying assumptions and implications of the information presented? Is the information relevant to the intelligence mission? Is the source biased? What technical considerations are there for the proper interpretation of the information? If the information originated in a foreign language, was it properly translated? Accordingly, a critical mindset comprised of an understanding of the functional variations of consciousness can improve the quality of intelligence production and reduce the effects of bias. Typological differences can create interpersonal challenges. An anecdote from my deployment illustrates how these differences can degrade the entire intelligence cycle. One of the staff officers in the battle group was self-assessed as an ISFJ, whereas I have INTJ preferences. Of the sixteen MBTI® types, ISFJs are often considered the “protectors.” As the name suggests, their preference for sensation and feeling makes them optimally suited to nurture, and it is no coincidence that the ISFJ staff officer had worked as a nurse in his civilian job. Notwithstanding our different worldviews and life experience, our typologies were in opposition. My extraverted thinking (Te), the way I typically deal with the external world and situations, was at odds with his extraverted feeling (Fe). Whereas I first asked where things were going and whether they were true or false, the other officer first examined the immediate history of the problem and considered how it affected people. ISFJs (introverted sensing and extraverted feeling) are largely driven by value judgments whereas INTJs (introverted intuiting and extraverted thinking) tend to base their decisions primarily on their objective analysis of cause and effect. For example, the other staff officer preoccupied himself with the potential human impact of a terrorist attack in Kosovo. Even though it had never happened, the remote chance that it could dominated his attention. Conversely, I relied on the likelihood of a kinetic attack taking place in Kosovo, which was assessed as low, so I was not concerned about it. It is common for feeling types to perceive thinking types as cold and aloof and equally common for thinking types to perceive feeling types as irrational and emotional. In my opinion, the staff officer’s strong sense of values colored and distorted his assessment of the operational environment. However, an INTJ’s character traits can be problematic at times in such a field as well. For instance, my preference for statistical probabilities tended to minimize the importance of the human aspect of the OE, which admittedly was the principal reason KFOR was established. INTJs are sometimes so focused on achieving the set goal that they neglect to assess the implications of the methods they use to achieve that goal. According to type theorists Leona Haas and Mark Hunziker (2011), a key feature of extraverted feeling types is their desire to “create or maintain harmony in the environment” (p. 94). Thus, the other staff officer evaluated and sought cooperation while I tried to implement objective standards for recognizing information of intelligence value, which could advance the mission per the commander’s PIRs. Our auxiliary function-attitudes constituted two different styles of decision-making. I aimed to maximize efficiency by creating an impersonal system of logical processes and he tried to minimize uncertainty by maximizing harmony in the work environment. My extraverted thinking contrasted sharply with his extraverted feeling to the point that it had an adverse effect on the entire intelligence enterprise due to the interpersonal friction it created. Although we were both introverts, we were different in nearly every other way. John Beebe’s eight function-attitude model further highlights these oppositions. 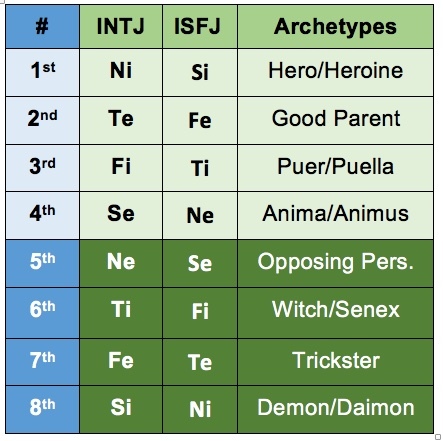 For example, my dominant function-attitude, introverted intuition (Ni), coincided with his eighth and lowest, which in Beebe’s model corresponds with the archetype of the demon/daimon. The demon/daimon is usually the least conscious of the archetypes in Beebe’s system, and it has both destructive and creative aspects depending on how well the personality integrates its latent energy. Conversely, his dominant function-attitude, introverted sensation (Si), coincided with the demonic archetype in my own typology. These stark typological contrasts seem to have had a detrimental effect on our ability to communicate, making our relationship awkward. It was as if our energies clashed rather than converged. If we had worked harder to consciously recognize the value in our differences, we could have likely invoked the daimonic or creative aspect of the eighth function rather than the demonic or destructive one. Moreover, my auxiliary extraverted thinking was his seventh function-attitude, which is represented by the archetype of the trickster. The trickster addresses issues concerning manipulation and paradox (Beebe as cited in Hunziker, 2016, p. 171). Conversely, his auxiliary function mirrored my own typology in that my extraverted feeling has trickster-like qualities. Because our auxiliary functions governed how we related to the external processes of the intelligence profession, it is not surprising that they (thinking vs. feeling) were a source of conflict during the deployment. It would not be correct to say that one of us was wrong; rather we were looking at the same problem through different typological lenses. For example, he considered “unemployment” to be the principal driver of instability in Kosovo. I felt that the high unemployment was symptomatic of a more fundamental problem, interethnic tension, which seemed related to the continuous conflict I observed in Kosovo’s dysfunctional political system. My assessment was based on extraverted thinking while his assessment stemmed from his extraverted feeling. He focused on the problems that he saw as most directly affecting people’s daily lives. I, on the other hand, focused on the behavior of political structures and systems because their effects are more demonstrable. One could say that each of us constructed only a partial picture of the situation, not unlike the well-known parable of the three blind men and the elephant, where each man feels a different part of the elephant’s body, producing three different conclusions about what the elephant is, what it means, and whether it is a pleasant or an unpleasant experience. Only together can they form a near complete picture of the elephant. Jung similarly described this problem in Psychological Types while discussing the differences between Sigmund Freud’s psychoanalytic approach and his own psychological theory, a phenomenon he called “the personal equation.” Jung (1921/1971) suggested that “the effect of the personal equation begins already in the act of observation” (¶ 9) and that “one sees what one can best see oneself” (¶ 10). Accordingly, the personal equation gives rise to a subjective prejudice that the individual is mostly unconscious of. One cannot overestimate the extent by which the personal equation colors intelligence assessments. Intelligence is not merely based on logical deductions, but also on value judgments, the territory of the feeling function. Likewise, intelligence can arise from a subjective insight, intuition, as much as from quantitative data, sensation. The personal equation is present in every observation and every statement we make. Acceptance and understanding of type dynamics presents a way that can help diminish, but not eliminate, the effects of the personal equation. In the field of typology, the concept of temperament also plays an important role in distinguishing cognitive styles. INTJs and ISFJs have different temperaments, and according to the model developed by Keirsey (1998), we may view observable clusters of behavior as activity patterns. Keirsey’s model links the four distinct temperaments—SJ-Guardians, SP-Artisans, NF-Idealists, and NT-Rationalists—to the sixteen MBTI types. INTJs belong to the class of Rationalists whereas ISFJs belong to the class of Guardians. That Rationalists and Guardians exhibit propensities for different leadership styles confirms the stark differences I noted between me and the other staff officer. Hirsh and Kummerow (1998) described the leadership style of Guardians as traditionalist and the leadership style of Rationalists as visionary (p. 8). The staff officer and I simply had opposing viewpoints about what constitutes effective leadership, and it was not that either of us was wrong, but merely different. For example, the ISFJ major faithfully relied on conventional military doctrine. Accordingly, he attempted to apply a force-on-force construct to the Kosovo OE. Such an approach understandably had mixed results in that Kosovo is not a conventional OE. The ISFJ leader tends to seek out practical solutions based on past experience to even the most complex of problems. The drawback is that in Kosovo, there was no straightforward precedent and no simple solution to any problem, no matter how thoroughly one had developed and applied empirical methods to the OE. INTJs, on the other hand, are very effective at thinking outside of the box and conceptualizing a model applicable to an OE like Kosovo. The drawback, however, is that such a leadership type often fails to clearly articulate the overarching intelligence strategy to his peers. INTJs are highly capable of finding solutions to complex problems, but they encounter challenges when trying to obtain buy-in to an idea. The INTJ has the tendency to assume that because he grasps the idea, everyone else should also. A leader cannot succeed if he fails to clearly articulate task, purpose, and end state to his team. We both wanted the same thing, but merely applied different methods to achieving that goal. If we had studied Keirsey’s model prior to the deployment and recognized that there is virtue in intellectual diversity, we could have aligned our leadership styles in a way that more effectively moved the mission toward a common objective. Such coordination, however, requires a superlative degree of psychological maturity on the part of military leaders. Given our temperamental differences, it is not surprising that we approached problems differently. If we had consciously coordinated our typological preferences, we would have been far more effective at analyzing and assessing the OE. Hirsh and Kummerow (1998) have underscored this approach, suggesting that INTJs should consider the input of feeling types and the sensory details required to make their vision a reality in their work (p. 22). Conversely, ISFJs should sometimes rely on the analytical logic of thinking types and entertain possibilities and alternate interpretations (p. 14). Another pitfall I observed in Kosovo was the propensity for some intelligence personnel to let the OE reinforce and confirm their own biases. People sometimes try to make the facts conform to their perceived value rather than adjust their value to the facts, which results in a fixed mindset. Wahhabism and Salafism are two of the stricter variants of Islam which adhere to a more traditional practice of the religion. The staff officer’s ISFJ tendencies unconsciously raised unnecessary and inaccurate assumptions about the two sects, who represented an extremely small cross-section of the population. Fundamentalist practitioners of Islam were eventually labeled Islamic extremists, which as a term is difficult to define. In the absence of precise language and collaborative assessments (competing hypotheses), the feeling function can distort intelligence. This phenomenon is related to Jung’s (1921/1971) concept of projections—“the expulsion of a subjective content into an object” (¶ 783). Jung contended that everything unconscious is projected (¶ 212). Hunziker (2016) has observed that “projections distort relationships, identity, and information” (p. 99). Most people, including trained intelligence professionals, unknowingly project their own unconscious contents into the environment. The ISFJ staff officer tended to see Kosovo through his own lens without examining the nature of that lens, which in my opinion, often significantly skewed his analysis. In all fairness, my two previous deployments in the Balkans had prepared me to confront and understand the problem of Islamic extremism. I was sufficiently sensitized to the situation by already having had extensive experience analyzing Islamic extremism in the Balkans, yet some could have viewed my reliance on logical deduction and my decision to take a calculated risk as a pitfall in itself. An extraverted thinker tends to rely on objective data while seeking out logical conclusions. 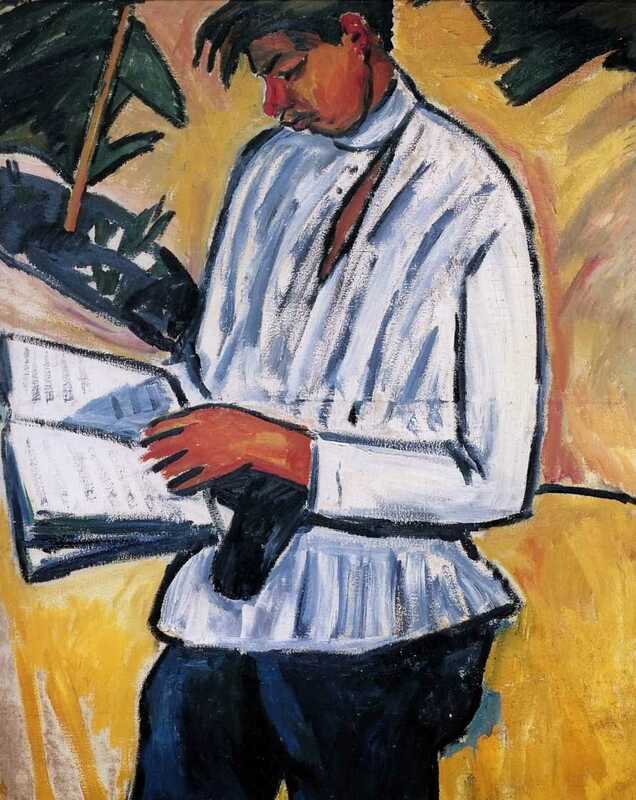 Jung (1921/1971) suggested that extraverted thinking types often subordinate their thinking to an intellectual formula, which presents itself as a general rule (¶ 585). The extraverted thinking type may overlook information inconsistent with his empirical experience. In fact, he can project his intellectual formula into the intelligence process, which may compel him to exclude plausible hypotheses. What if, for instance, Islamic terrorists were in fact planning a terrorist attack on Camp Bondsteel? One could argue that my extraverted thinking was not sufficient for assessing the scope or magnitude of the problem. Few can deny that there is a legitimate problem with Islamic extremism in the contemporary world, which subsumes the Balkans. Thus, the other staff officer’s fears were not altogether misplaced. Only by working consciously in concert with one another would it have been possible to take full advantage of the functions in practice to overcome our biases. Introductory typology training could have helped check these biases. It is fairly common for intelligence professionals to not recognize their own innate typological preferences and the type dynamics that arise when building an intelligence enterprise comprised of different cognitive styles. Although the Department of Defense has made progress at closing the gap between intelligence analytic methods and depth psychology, considerable work stills needs to be done. DoD has taken major strides at senior leader professional development programs such as the Command and General Staff College and the U. S. Army Sergeants Major Academy, but initial entry training courses do not include any blocks of instruction on typology in their curriculum. DoD thus can do much more to enhance the self-awareness of intelligence professionals, including considering depth typology a potential force multiplier. DoD should revisit the theories of C. G. Jung, in particular his typological system, to overcome what has been called the “mind-set” challenge (Central Intelligence Agency, 2009, p. 1). Awareness of Jung’s typology, with its emphasis on the personal equation, can help compensate for the limitations of the human mind. Cognitive bias is a perennial problem in intelligence analysis. Most DoD certified operational psychologists who advise military commanders possess limited understanding of what Hunziker (2016) has called depth typology: a holistic typology that seeks to understand the whole personality including both its conscious and unconscious aspects (p. 4). By introducing a revamped and practical program of instruction on type theory and application, DoD can significantly improve its analytic tradecraft. Intelligence professionals need to recognize their own innate typological preferences and the type dynamics that arise when building an intelligence enterprise comprised of different cognitive styles. Thinking through a problem is not enough to identify its solution. Rather, the intelligence community should be able to exercise and understand all functions of consciousness to challenge the underlying assumptions which often make intelligence analysis problematic. The military could also work closely with Jungian analysts and type theorists to design a protocol to evaluate intelligence professionals. Mandating the administration of the MBTI or a similar typological instrument during pre-deployment training could further enhance self-awareness and promote professionalism. The availability during deployment of a coach or mentor familiar with Jung’s theories and typology would add value to classroom instruction through continuous refinement of its practical application. Heuer (1999) echoed a similar approach when he suggested “training will be more effective if supplemented with ongoing advice and assistance. An experienced coach who can monitor and guide ongoing performance is a valuable supplement to classroom instruction in many fields, probably including intelligence analysis” (p. 179). A precise yet comprehensive manual or smart book detailing the tendencies and preferences of different types could also improve the quality of intelligence products in both training scenarios and real-world environments. The military could develop typological training aids and combine them with empirical methodologies that have demonstrated their reliability and efficacy in the field. The importance of the role of the analyst in intelligence production cannot be overstated. An analyst who can see his own biases and separate them from his analysis and production will yield a more accurate assessment. At all echelons, to make sound and effective decisions, commanders require quality intelligence, which in turn drives the operations needed to successfully accomplish the mission. DoD’s investment in depth typology could mitigate the cognitive bias in practical and cost-effective ways. Dweck, C. (2016). Mindset: The new psychology of success. New York, NY: Ballantine Books. Department of Defense. (2017). DOD dictionary of military and associated terms. Washington, DC: Joint Staff, J-7. Heuer, R. (1999). The psychology of intelligence analysis. Langley, VA: Central Intelligence Agency. Hirsh, S. & Kummerow, J. (1998). Introduction to type in organizations. Palo Alto, CA: Consulting Psychologists Press. Hunziker, M. (2016). Depth typology: C. G. Jung, Isabel Myers, John Beebe and the guide map to becoming who we are. Clayton, NC: Write Way Publishing Company. Jung, C. G. (1927/1970). 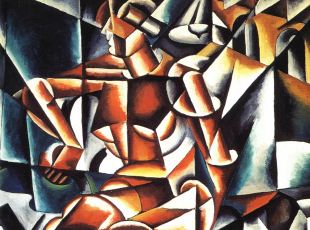 The structure and dynamics of the psyche (CW 8). H. Read, M. Fordham, G. Adler, & W. McGuire (Eds.). (R. F. C. Hull, Trans.). Princeton, NJ: Princeton University Press. Jung, C. G. (1935/1976). The symbolic life (CW 18). H. Read et al. (Eds.). (R. F. C. Hull, Trans.). Princeton, NJ: Princeton University Press. Jung, C. G. (1989/2012). Introduction to Jungian psychology: Notes on the seminar on analytical psychology given in 1925. Princeton, NJ: Princeton University Press. Keirsey, D. (1998). Please understand me two: Temperament, character, intelligence. Del Mar, CA: Prometheus Nemesis Book Company. U.S. Army (1989). FM 100-20: Military operations in low intensity conflict. Washington, DC: Headquarters, Department of the Army. U.S. Army. (2012). ADP 2-0: Intelligence. Washington, DC: Headquarters, Department of the Army. U.S. Army. (2014). FM 2-0: Intelligence operations. Washington, DC: Headquarters, Department of the Army. Thanks for showing us how applying an awareness of typological preferences can improve our abilities to interact more respectfully and effectively with one another. As one who was responsible for how we taught type theory at CAS3 and who has trained many CGSC faculty, I agree with you that we are doing a poor job of maximizing the value of Jung’s theory as it is currently being applied. The military rank structure, subordination of authority and respect, and need to always project supreme confidence at the risk of seeming less competent, thus displaying any personal vulnerability would seem to be a major obstacle in the way of even discussing such psychological depths with those with little understanding of them. Challenging the status quo or asking meaningful questions, in my experience in the military in general is often frowned upon, if not given a blank stare. When i was in OCS, for example, in a land navigation with a compass course, i asked about factoring in the incline of hills in measuring one’s distance in a land navigation practice. This class was taught by officers who presumably would know the answer to this question, but i got nothing back but a thousand yard stare. Furthermore, asking meaningful questions seemed to create so much friction and i was so disappointed with the non-answers provided to questions of life and death importance that I DOR’d from the program. I had other reasons as well for withdrawing from OCS, but i felt as though i was often dealing with people with double digit IQs. I think your work and the depth of your insight is very important. I’d like to see it employed in much the same way that military recruits should be psychologically evaluated as part of the screening candidates for the enlisted and the officer ranks. It’s far too endemic in the military to not make waves, thus never asking the important questions, even if it means saving lives. I went through Marine Corps basic training; and do you know how much time we spent on hand-to-hand combat? Maybe two hours, tops! If Marines are given such cursory instruction in hand-to-hand combat, then it seems like brain-to-brain cognition and open discourse about within the ranks will be doomed as well. I hope that i’m wrong! My hope is that your insights can be put to use and that somethings can be done with it besides a short, throw-away period of instruction. I would suggest breaking these complex principles down into easily understandable language so that it can be more easily absorbed. If Confirmation bias is the issue…and that stems from experience…What then should military leaders do about undergoing experience? Should they learn from it? If so…what should they learn. That is to say…should they approach every situation like it is brand new and ignore their previous experiences? Or should they rely simply on data and interpret it based on nothing except doctrine. I am a Special Education teacher…and this population of professionals is probably the most introverted ‘feeling’ population in the world. And having to step back and assess a learner while ignoring all of our previous experience concerning similar kiddos…and looking ONLY at the repeatable, assessable, measurable data…is astonishingly difficult; because we feel (see!) that we are reducing a unique situation to a set of numbers. So we have to look for different things to learn as we grow as professionals. In our realm..we look for the endgame because we are playing the long game. What do we need to do so that this student becomes a functioning contributing member of society? As long as we keep our eye on that prize…understanding the data as a tool rather than a set of unfeeling measurements…is easier. Military situations, however, don’t have that long game luxury…and so…my overarching question is this: What should a military leader gain from experience…so that the confirmation bias can be bypassed in decision making? Are there different criteria that should be utilized for six week situations than six month situations?…and what might those look like. This is a very interesting article that raises a very good question concerning human foibles that must become fortes. Excellently written…I hope to use this concept in the next meeting I run for my district. Firstly, thank you for taking the time to read and comment on the article. I think the central point is that military intelligence professionals really need to understand the depth psychological factors of their thinking, and the models we tend to unconsciously construct based on bias. At the end of the day, all we have is our experience and that is a perennial problem in that new experiences are conditioned by the old ones. I suggested in the article that we really need to establish a baseline of instruction to point out these things to try to “catch” them in the act before the burglar makes off with the television set. I need not list off the numerous blunders we have made due to faulty intelligence or succumbing to cognitive biases. We invest billions of dollars into technology as a way to give ourselves an edge over our adversaries, however, sometimes we ourselves, and our team members become adversaries, and that is never a good thing when so much depends on the accuracy and wisdom of one’s decisions, which would be a matter of life and death. In regards to your question: “What should a military leader gain from experience…so that the confirmation bias can be bypassed in decision making? Are there different criteria that should be utilized for six week situations than six month situations?” We need to be able to rely on each other’s experience in a collective setting, especially in intelligence work, and be able to build a model that relies on all the functions not just one or two of them. To quote Jordan Peterson, I would conclude with the following: “We need to know four things: what there is, what to do about what there is, that there is a difference between knowing what there is and knowing what to do about what there is, and what the difference is” (p. 2, Maps of Meaning). Thank you. I’d love to see Audie apply this to the Qatar mission. Kiley: Don’t know if you recall us having a conversation about the awesome responsibility of military intelligence gathering for many of the reasons that you’ve addressed in your serious study into the matter. You are a truth seeker, my friend, and for this i salute you! It’s refreshing to see a Commander to think about thinking. We need more commanders like you Sir. In the joint Intelligence environment it’s far worse than group think. We undergo a problem called pack journalism. Pack journalism is when a group of organizations seek out the majority of the organizations’ assessments regarding a particular topic and come to consensus with the majority without having done due diligent analysis of their own over the problem at hand. Further, the hierarchy of the military and its heavy reliance to act as a single unit with little to no discretionary power for the individual Solduer combined with the Military Decision Making Process will never foster an environment for creative thinking. I’ve had previous Company Commanders who found my creative thinking as insubordinate and offensive. You write your command philosophy so we can all essentially think and move together in a single unit the way you would (group stink), because ultimately you are responsible and answer for our wrong doing in a legal doctrine called Respondaet Superior. At Huachuca they do administer Myers Briggs, but only one person that I know of has applied it to effectively form TOCs. In building flag ship products at CENTCOM, a Senior Intelligence Analyst will not receive a go from his superior until he lists out his assumptions. Identifying the assumptions assists the chain in knowing what the Analyst is thinking to mitigate confusion. In the course of my daily routine I would list many assumptions in my outline before I would set out to build my product. The more assumptions for me the more I could boil down to a level of certainty. In making my assumptions, I would rely heavily on what Heur calls “thin slicing” because I have a huge breath of knowledge with depths of knowledge in PMSCII-PT, and an amazing ability to recall facts, so for me to draw a conclusion based on receiving little data was very easy and very rewarding (minus the jealousy of my coworkers). In my thinking, I would create hypotheses and try to prove them to be true based on logical reporting of multiple and reliable sources of information that corroborate each other, and I found this was the best way and only way to produce intelligence products. I would avoid “anchoring” by constantly reminding myself of egocentricity and ethnocentricy, and would strive to create alternative hypotheses using divergent thinking. A lot can be learned from Psychology in Intelligence; unfortunately, life is too short and too many irrelevant requirements exist in the military, such as counter human trafficking training. Thank you very much for responding to the article as well as comparing the article’s insights to your own experiences as an intelligence analyst. I did not know that the basic course is now administering the MBTI to its officers. This is indeed a step in the right direction. I’m glad that the article resonated with you and I hope you will be successful in applying these ideas to future endeavors. Thank you.